EquipNet Inc. (Canton, MA.) 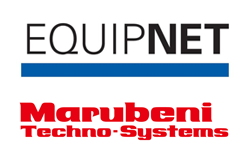 and Marubeni Techno-Systems Corporation (MTS) (Tokyo, Japan) have signed a collaborative agreement appointing MTS as EquipNet’s exclusive partner in the Japanese market. Under the terms of the agreement MTS will have exclusive rights to promote advertise and market EquipNet’s services. The two companies will team up to deliver services that include buying & selling of secondary market equipment utilizing EquipNet’s Global Marketplace. EquipNet is a global leader of surplus asset management solutions. We’re recognized for our proprietary asset management platform, our revolutionary industrial equipment marketplace, and our results-driven project management services. Our diverse roster of clients include Fortune 500 multi-national corporations, leading regional manufacturers, financial institutions, and corporate renewal professionals. EquipNet solutions deliver maximized financial return while improving our client’s corporate image, adhering to their safety standards, and contributing to their sustainability initiatives. Marubeni Techno-Systems Corporation was established as an independent machinery trading and solution company in April 2000. The evolution of machinery technology has brought great diversification in the field of industrial development. MTS has long experience in handling industrial machinery and deep, high-quality expertise in the information collecting capabilities needed to keep abreast of diversification. MTS handles all kinds of machinery and equipment heavy and light and is actively involved in promoting the introduction of the latest industrial machinery technologies, as well as formulating and bringing to fruition a wide range of projects in many industrial fields.